What port should I open to allow remote desktop? 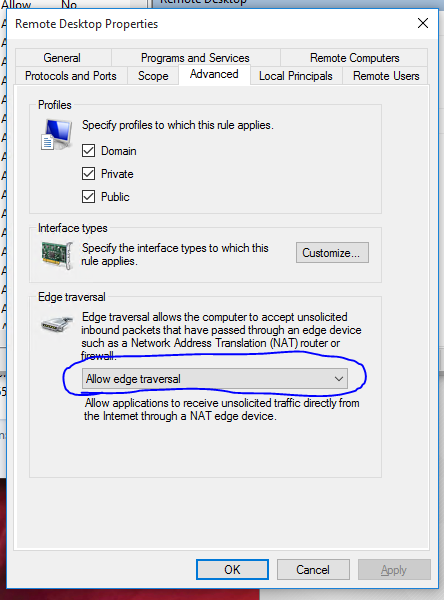 What port(s) should I open/NAT to allow me to use Remote Desktop? Remote Desktop requires TCP port 3389 to be open. It is possible to change the port used by the terminal server (or PC which is accessed), see this Microsoft support article: "How to change the listening port for Remote Desktop"
The only exception to the previous answer (3389) is when using Small Business Server through Remote Web Workplace. In this case the server NAT's the connection between you and server port 80 (HTTP) or 443 (HTTPS), and then to the internal computer; so only 80/443 is required. If you don't want to use 3389 externally, open a different port externally, but point it to 3389 on the IP address of the machine you want RDC on. This is helpful for routing many systems with RDC. It's also nice because it won't require any registry edits. What ports should I open for remote desktop - Answer: None. If security is concerned and you happen to have an Linux based router(e.g. OpenWrt), then don't add any NAT entry, for 3389 in this case. Use your router as a jump server and create a SSH port forward. Your router's sshd listens on 22 port for LAN network. it also listens on port A for WAN network(the only one exposed), with only public-key authentication, so no brute force password attempts. Not the answer you're looking for? Browse other questions tagged remote-desktop rdp windows port or ask your own question. How to send ctrl+alt+del using Remote Desktop? What firewall ports need to be open to allow access to external git repositories? How to allow active directory users to remote desktop in? Connecting to Remote Desktop using proxy and Remote Desktop Gateway?